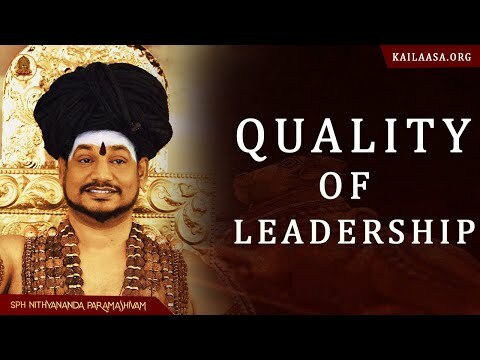 PARAMAHAMSA SRI NITHYANANDA on Serving others is Leadership LEADERSHIP is the result of a conscious choice made by an individual. Most of us achieve the status of a leader, but not the state. State is totally different from status. Status comes from society. If we are leading a group of people, or if we are forced to take the responsibility of some department or if we take the responsibility out of greed, the status comes. Leadership ‘state’ is totally different. When I use the word ‘state’ I mean our inner space or our being should be mature enough to handle what we are entering or the responsibility which we are assuming. When we just get the status without achieving the state, all the problems which exist in the corporate world start — stress and tension at the personal level, and backbiting and politics at the level of the team. When we become responsible for others, we no longer are focused on ourselves. We move towards serving other people. Serving other people is leadership. Caring for our own needs without shifting the focus to others is absence of leadership. A responsible leader is a person who is able to respond spontaneously to situations, who is fresh and continuously keeps himself alive. However, most of us are constantly taking decisions, unaware and unconsciously through our past memories or Engrams. . As long as we are caught in our unconscious engrams, we can never achieve the state of a leader. We may achieve the status of a leader with a lot of suffering and struggle. When we sit in the leader’s chair with a lot of suffering and struggle, we tend to create the same suffering and struggle for our subordinates. These engrams dictate our productivity, interpersonal skills, teamwork, judgement — all our responses and behaviour. But engrams are never understood or given any importance in the field of corporate training and leadership development. Eastern mystics have spent thousands of years exploring and discovering the inner world. They have created tools and techniques to create the right ‘inner software’ to cultivate leadership skills. Meditation techniques are the software that help us eradicate the engrams. Our goal should be achieving the state of consciousness of a leader and not the status that is achieved by becoming a leader. Let us all start shifting our energy to achieving the state of leadership. There is an invaluable feeling of fulfilment that happens to beings who achieve leader consciousness. Be Blissful!